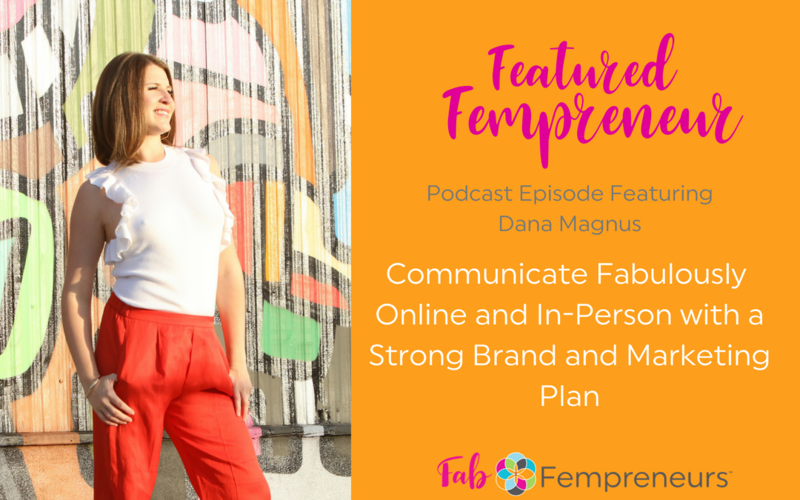 In this episode of The Fab Fempreneurs Podcast Show, we feature Fempreneur, Dana Magnus, uses her unique, systematic approach to creatively position your team’s values and mission in front of your target audience. When you effectively market your Business’ Brand, you are building your value, your vision, your purpose, all while drive your best clients to your services or products! 1) Your next big steps to relate your business, your unique personality, and your mission to your paying clients. 2) How to navigate your journey through the Marketing Jungle with a strong marketing strategy that catches attention, connects with your audience, and strengthens your business’ brand. 3) How you can have Corporate Social Responsibility with Eco-Friendly Marketing tactics that you can begin implementing immediately. You are FABULOUS! Thanks so much for joining us on the show. If you loved the episode please share it using the social media buttons on this page. We want your feedback and squad support! Would you please take a minute to leave us a positive review and rating? We are passionate about supporting and guiding women to be successful in business so they can make more money, make a bigger impact, and have more fun! Your rating and review will help us to do that. Thanks! Remember to subscribe to the podcast in iTunes to join us on this Fab Fempreneur success journey AND never miss an episode!